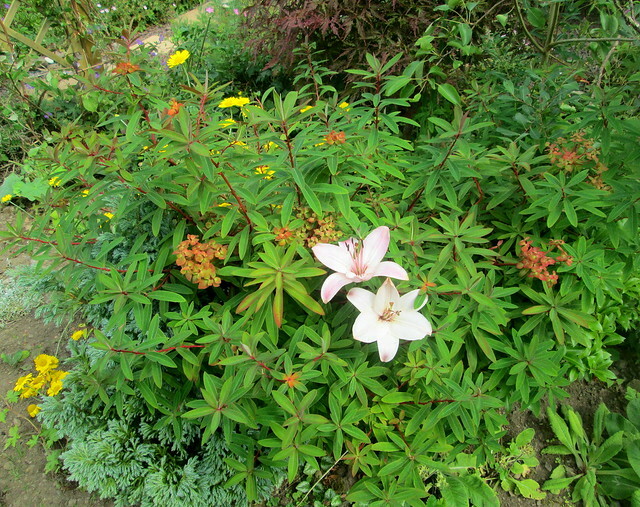 This entry was posted in Gardening and tagged euphorbia 'Fireglow', my garden in Fife by Katrina. Bookmark the permalink. 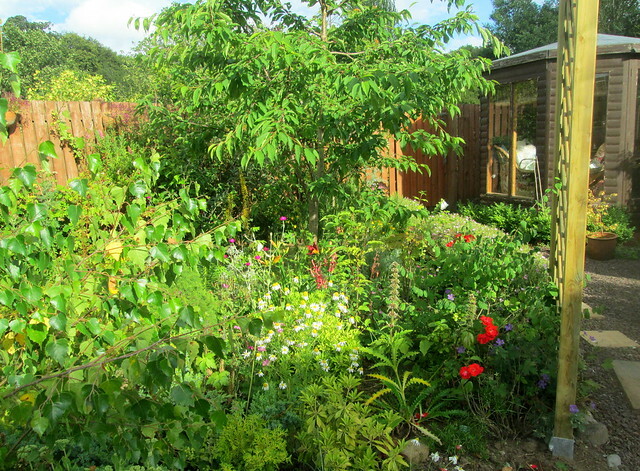 I always enjoy seeing your garden…just a little jealous of your strawberries and raspberries. Your back yard is so much fuller than what I remember from earlier pictures. My husband and I also got married in 1976! 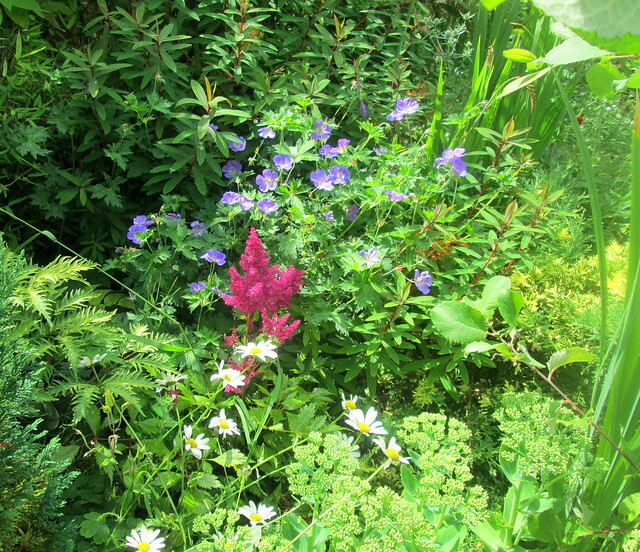 Our Spring was so late in appearing this year – then everything in the garden just sort of exploded in early May. I’ll have to move some plants soon though, before the frosts come as some are outgrowing their space. 1976 was a good year for weddings it seems! Our anniversary is August 2nd. Thanks – it’s a work in progress of course! 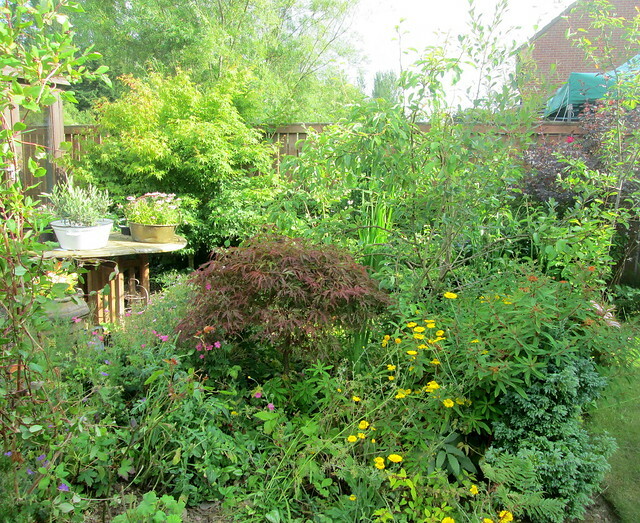 I’m still impressed by how full and lush your garden is after such a short time. It’s gorgeous. Some things have grown too lush. I’ve had to prune the cherry tree already. I’m puzzling about the roses, wondering whether any additional watering might have necessitated extra fertiliser to get those repeat flowerings (I have no idea what soil-type you have). One of the sights and scents of summer here is a rose-garden in full bloom, simmering in the hot sunny days. Lucky you with the raspberries and strawberries! Hope you eliminate the potentilla – it would be a pity to lose the structure provided by the other plants. Euphorbia sap can be beastly stuff! My soil is heavy clay and it has proved to be much better for growing roses than my old garden with its light sandy soil was. I did water and feed the roses but it seems to have been a problem for a lot of rose growers in the UK. Maybe it would take a few years of hot summers before they got used to it here, but I doubt if hot summers will be a regular feature here somehow! My bush roses have been quite good, the problem has been mainly with climbers and ramblers. 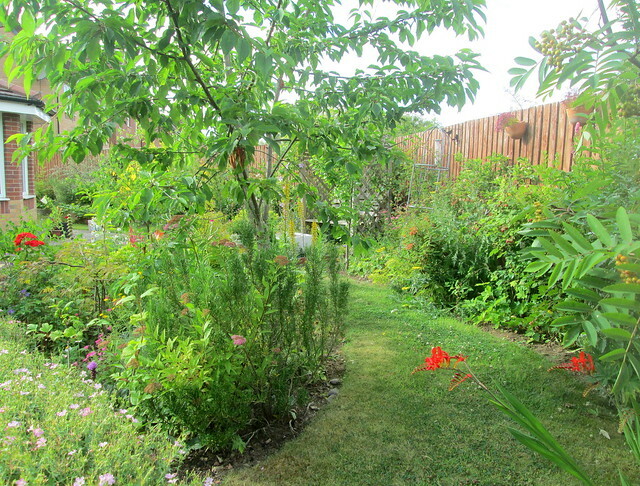 It has been fun seeing how your garden has developed over the years. How many years has it been? I had been thinking about planting some Euphorbia because I like the looks and it is drought tolerant, but worried about handling it with the irritating liquid. Although I usually do use gloves as a matter of course. We have lived at the new place for just over four years now and the ‘garden’ was just all grass then. I would love the fences to be obscured by plants but I think that’ll take a few more years at least. I think that as long as you know that Euphorbia can be dangerous then it isn’t a problem, it’s easy enough to avoid the sap even if you have to cut it back. There are so many lovely Euphorbias to choose from. 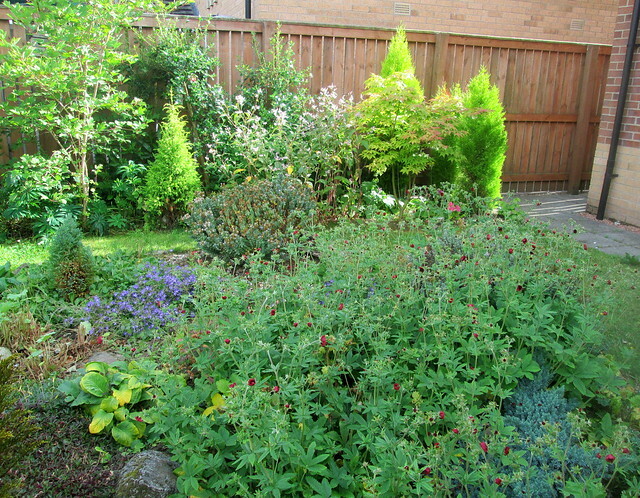 Your garden has come on so much since that patch of grass when you moved in. I can’t believe the change. Thanks. It has been hard work but it’s a good way of keeping fit-ish.